This will be an ongoing event throughout the Weekend! Keep your eyes open for characters, and clues throughout the event. Will you be the one to solve the Mystery? The Story Line of Blackraven Curse Murder Mystery! 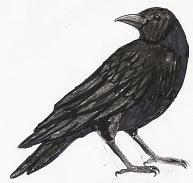 It all started in 1883 when Micheal Blackraven became very secretive about the land his family had owned for centuries. In order to protect it he felt it necessary to place a curse upon its borders that should anyone cross them without proper permission they would be evaporated into the thin air. Of course this did not affect wandering animals and magickal creatures so they were constantly wandering in and out of his land as they wished. Well seven years after he had cast this his next door neighbors’ favorite familiar Jinx the cat happened to cross the curses’ borders. Well Matilda Whitefield loved and cherished Jinx so much that when she saw him on the Blackraven land she totally forgot about the curse. She went running across the border without thinking, and evaporated into thin air like any other soul without Micheal’s permission. Well now even though the Blackraven and Whitefield families had been very strong allies for many years there was still a little bit of rivalry between them even before this whole thing started. You see both families where the most powerful witch families in the state, but neither family would accept the other being called the most powerful. Well this was the straw that broke the unicorns’ back for Magda Whitefield, the matriarch of the family. She insisted that one of the Blackraven family members had either spelled Jinx or had used his favorite snack food to trick him across the border, and using the curse to kill her oldest Matilda who was about to become handfasted to the oldest son of the Blackravens Joe. Of course the Blackraven family denied this left and right. But she would not hear this. See the fact that both families where the strongest in the state meant that if their families married into one another this family would then become the strongest of the region. Well this just was not acceptable to either side’s elder’s. Joe Blackraven of course like any good lover went to the memorial for his beloved, but was the only Blackraven in attendance. This enraged Joe so much that he placed a curse upon his own family that if anyone in his family fell in love with another Whitefield he or she would die prior to their marriage. He promptly then went into hiding, and has never been seen or heard from since. Well in his rage and grief Joe had not realized he had cursed both families. You see like with all the love stories you tend to want what you can’t have, and that is exactly what happened with these families. In 1900 Lord Draven Blackraven fell in love with Lady Elaine Whitefield, not three days before the Handfasting Lord Draven Blackraven fell ill, and died with a mysterious illness. Elisia Blackraven fell in love with, and became engaged to Joseph Whitefield in 1927, and she sadly died 6 weeks after the engagement was announced. Several others have lost their lives to this curse, and sadly tonight it seems there will be another. But who will it be?